We are located in West Orange and we have one goal, to make washing your clothes easier and clutter free. 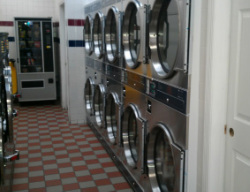 BIg Wash Laundromat, is always kept clean with an attendant available from 3pm-6pm. The machines are regularly maintained to ensure that your clothes get washed the way they should. We have been serving West Orange for 15 years and from the beginning we have offered many quality services such as self-service, wash and fold. We also free wifi, soap, beverage and snack vending. We accept nothing less than excellence. New Washers that are well maintained. HD Television to keep you entertained. New Dryers that will dry your clothes quickly.